Here at Ionic Industries our latest guide to changing the battery in a Braun Oral-B toothbrush has been published, this time for the Professional Care Type 4729 model. These were very popular toothbrushes from Braun Oral-B and are fairly straightforward to open up and repair. Take a look at the full Braun Oral-B Type 4729 Battery Replacement Guide here or leave a comment below! Thanks Richard, that’s a good point. Good to hear that you got your toothbrush repaired and running. So my battery is not the problem… the little motor is so goop’d up that it wont turn. So how do I take the front apart so I can soak it in water or something as well as grease the motor shaft? Thanks in advance for advice. Hi Tom, I’d recommend cleaning the toothbrush with warm water before opening it so you can clean any toothpaste residue off. If water has got inside the brush and seized the motor then the best you can do is apply light oil to the bearing at each end of the motor and turn it by hand to free it up. Changed the battery and not confident that my soldering is good enough: the green light is flashing very fast, rather than slowly and regularly. Check your soldering to ensure that there are no dry solder joints and no short circuits or solder bridges on the circuit board. Bad soldering is usually the cause of charging problems and it is essential that you get a good electrical connection otherwise the battery will not charge. Stray blobs of solder can short out components on the circuit board. The copper wires from the charging coil inside the bottom of the toothbrush handle can easily and almost invisibly break so check that these are all fully intact and connected. Sometimes with just one wire broken the toothbrush will appear to be charging but it won’t be recharging the battery. There is a weak point where the wires are soldered to the circuit board. Thanks to your easy guide I have just successfully replaced the battery on the second Braun toothbrush in our household (different model this time) but just as easy. As with the last one I did I think it really helps if you use desoldering wick rather than a desolder pump, also after you have removed the solder off the three front connections they will probably be still stuck down so just use the sharp edge of the knife blade to lift the tags up. For the negative connection just heat the joint and press on the positive end of battery and it will pop out. Not sure what has happened. Instructions followed but when charging a red light is observed – flashes a few times and then nothing. Motor can start then stops. Hi Andy, it sounds like it’s not charging. Try leaving it on charge for an hour or two as sometimes it takes that long before the brush realises it’s being charged. Also double-check for blobs of solder on the PCB near the battery connections. I followed your excellent instructions, re-assembled the brush and placed it on the charging stand, observing the charge light. However, the brush won’t run after testing it the next day. I dis-assembled again, thinking perhaps that a motor lead might be off, but noticed that both the motor and the battery were warm, too warm if you ask me. I de-soldered both the motor tabs and battery tabs and removed the battery. It reads 1.25v so I’m assuming it got charged. I tried going directly to the motor itself with a 1.5 volt source but got nothing. Bad motor? I’m 100% positive I did not install the battery with the wrong polarity, the positive was near the motor, the negative near the charging coil at the bottom. I’d appreciate any ideas, thanks again. Hi Mike, it sounds like the circuitry is trying to drive the motor but if the motor won’t run directly off a 1.5V source then there could be something jammed in the gears. Try turning the metal shaft of the brush back and forth by hand or turning the gears by hand. Ok, good suggestion, I was able to fairly easily move the nylon gear which moved the motor’s brass gear and the shaft linkage, so nothing jammed. Tried the 1.5v again on the motor, not even a peep. Bad motor? Sounds like it could be 🙁 That or the capacitor across the motor terminals is damaged. Make sure the motor is disconnected from the PCB when you’re testing. Try the 1.5V across the motor with both polarities in case there’s a diode hidden in there to stop back EMF. The motor is definitely disconnected, and I just tried both polarities, nothing. I’m guessing this is probably not worth repairing in that event then. And that maybe my old battery is fine! Sadly you might be right about the motor – it’s very rare if there’s been no water damage inside the brush. Excellent step by step instructions. Toothbrush now working as new. More to the point, excellent service for battery ordering. I did not concentrate properly and ordered the wrong battery. Rob promptly replaced it for me, only for Royal Mail to shred the envelope and lose the battery! This was again sorted promptly and the toothbrush is as good as new (if not that clean!). Great to hear about your modification Richard. The longer battery must last for a lot more brushing sessions than the original battery! Hi Walter, have a read through our trouble-shooting tips, there are a couple of techniques near the bottom for resetting the battery meter. Thank you. There must be a magic charge time for this process, as previously I had tried a few seconds and also hours and neither worked. I tried about 10 seconds as recommended and it has already run longer than for ages. I will let you know how it goes in terms of a full reset. Hi, had to undertake this over several weeks and although I kept all parts in a box did not notice I had lost the spring. However fitted all back together but have to raise the toothbrush 1/4″ of the charger to get the green flashing light. Will leave for 24 hrs but surprised did not get any movement when I pressed the on switch. The shaft will not turn manually as I see other posts say it should do. Measured the new battery and it read 1.275 against the old one’s 1.244, odd that the new one before charging does not give a murmer? Hi Dave, that’s a good voltage reading from the new battery so have a look through the troubleshooting tips on our customer support page here, particularly the coil tips. In the short term the brush will operate correctly without the spring supporting the battery but in the long term the missing spring might allow the battery to pull away from its connections. This guide is just brilliant! What can I say? My toothbrush was barely getting one use between charges and I baulked at paying huge sums for a new one! (Tightwad lol) This guide has enabled me to breathe new life into a perfectly good brush. First time, no luck – just a fast flashing red light so I took it apart again. The negative tag wasn’t soldered quite right and had become detached. Fresh solder and tried again…..success! Thank you for this invaluable guide! Must be the best guide anywhere on anything. Thankyou! Hi Dominic, you can fix a broken coil wire by soldering the two pieces together. If necessary you can unwind one loop of wire from the coil to give you more to play with. There’s also a blog post here that might help you fix the wiring in your toothbrush. Great guide, It took me 20 minutes to replace the battery and now toothbrush is working again 🙂 Thank you. My oral b braun electric toot brush won’t hold a charge for more that 3-4 days, so I had Battery Plus change the battery. Now with the new battery fully charged it won’t run. I can’t find any lose wires or anything. Got any ideas? Really don’t want to throw it our as it was working fine before they clanged the battery. If a repair shop changed the battery for you then take it back to the shop – the repair should be under guarantee. We also have a guide to fixing common issues on our customer support page. I have had it for years and need to put it on charge all the time. It stopped working the other day. When i took it apart i see the three wires from the PCB to the coil are broken. Hi Steve, yes you can repair the wires by resoldering them. Make sure you touch the wires with the sodlering iron to burn off the thin transparent insulation. See our blog post on repairing the copper coil wires here. In preparation for the replacement procedure, I had already taken the device apart once, concluded that it was fitted with a 42mm battery, decided for the “larger battery and cut down the spring” option and sourced a 48mm battery. With full confidence in the guide, I followed the steps to the letter, only to realize that it’s missing one crucial point when opting to put in a larger battery (which cost me a wasted battery). More precisely, the battery tag for the negative terminal should not at all be trimmed “to the lenght of the original battery”, instead most likely be left in full length (or more precisely “orginal length +6mm), this since the negative terminal of a longer battery will be that much farther away from the circuit board solder point. 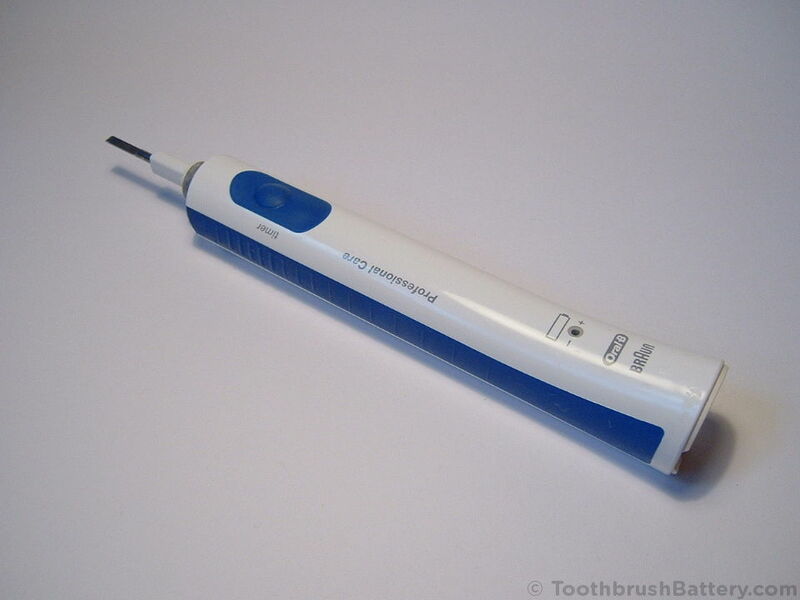 Open up the toothbrush using the relevant guide and check for corrosion around the motor and PCB. Ho letto delle sostituzioni e delle riparazioni. Io non ne sono capace. Esiste un centro per farmelo riparare pagando? E dove? Salve, we keep a list of toothbrush repair services. I have just replace battery second time. Seems it stands for ~2 years. It is not bad. Thanks for your perfect manual. You’re welcome. The battery life depends on how many people use the toothbrush and the quality of the battery you use.